As the premier SEO company in Jacksonville, we know that search engine optimization (SEO) ought to be a crucial part of every company’s marketing strategy because nearly all consumers use the internet to search for goods and services. (Nearly 97% according to a 2014 study by Parago, a consumer behavior company). The ascent of SEO-driven marketing has trumped traditional advertising channels (news, radio, etc) as well as pay-per-click (PPC) advertising. Companies are driving this change because they have discovered that search engine optimization provides a superior ROI compared to other marketing channels, and that organic rankings are more stable and attract approximately 90% of clicks compared to paid ads. What that means, to you, the business owner, is that consumers trust organic search results far more than online ads. 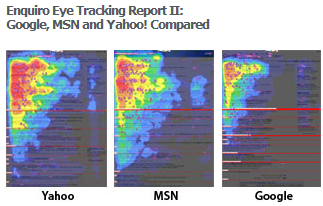 Notice, also, how in eye tracking studies, users most frequently look at the upper left hand side of the search page, rather than in the sidebar on the right, where ads are located. What this tells us is that people who are searching for your business are most likely to click on results and visit sites located at the top of the organic search results. Moreover, only 14% of web users trust sponsored ads, according to the same study, while the other 86% of the population trusts organic rankings. Just ask yourself, when was the last time you clicked an ad or went to the Yellow Pages to find a business? Still, even with all the progress in SEO and the profits it consistently generates for companies, there are still businesses that are not yet in the game. With more consumers buying online, or at least starting the purchasing journey in front of a computer, both small and big businesses must take SEO seriously if they hope to maximize their revenues. There is a reason why all the Fortune 500 companies have whole departments dedicated to maximizing their online presence. Thus, the only one losing by holding out is the business owner who is clinging to outdated and ineffective marketing strategies. Still on the fence? How many of these popular SEO myths do you still believe? Search engine optimization is too expensive. First, SEO should be thought of as an investment. Here’s why: increased prominence in search results for valuable keywords equates to higher profits and more visitors to your website. Additionally, it is often far less expensive than the PPC (Pay Per Click) ad model and delivers superior ROI and measurable returns. In the end, not allocating advertising funds for SEO is more expensive in terms of lost market share, because your competition will own the first page of search results instead of you. SEO is a time-consuming process. This one has a grain of truth in it, because if you have done nothing to position your website for success, there will be a good deal of foundation work to do. Just as none of the great brands became an overnight success, SEO is not an overnight solution. It typically takes 3-6 months for a website to start making some serious waves. However, with a smart SEO strategy in place, your business will have all it needs for building your brand online, which gives you an enormous advantage over your competitors for getting recognized online. SEO is ever-changing and somewhat unpredictable. It is true that search engines do get algorithm overhauls to improve the quality of search results, but that does not mean that websites will be negatively affected. In fact, an ethical SEO stays up-to-date with best practices in the online marketing industry, and would never put a client’s site at risk. The dynamism inherent in technology of any sort drives us, at our Jacksonville SEO agency, to be in a constant state of learning. Our clients benefit from our experience, which allows us to help them avoid ranking fluctuations resulting from algorithm updates. As search engine technology evolves, our team evolves with it. If you’re a business owner in Duval or St. John’s county, get in touch with us now to receive a complementary website analysis.